With Walmart introducing their own post-paid service, it offers yet another low cost solution to families who don’t need the full spectrum of carrier offerings. Piggybacking on the T-Mobile network, Walmart will offer unlimited talk and text for $45 dollars per month with each additional line costing just $25. Data will come in 100MB increments with one free 100MB, which will be shared by all lines on the account and easily refilled through an online account manager. So without further ado, we’ve gotten what we believe are first screen shots of the boxed service in the wild and available for your viewing pleasure! Check the rest of the shots below! How much does that Cliq XT cost? I’ll bet it costs a lot less than the $399.99 that TMO charges for the thing. NVM I see from the original post that it costs $249, hmm $150 cheaper than the “MSRP” and people still maintain that these aren’t inflated prices. Before you troll more about pricing Robert, think about Wal-Mart and how their entire operation works. They bully a manufacturer into selling them something at a super reduced price because they are Wal-Mart and they will not sell anything you make if you don’t give them the price they want. It’s no surprise to anyone that the pricing on ANY phone at Wal-Mart is cheaper. In fact if you are surprised then get your head out of the sand. $249.99 for the Cliq XT on WFM. Yeah I saw that and posted at almost the same time. If you want a Cliq (it’s not for me but at least you can put a custom ROM on the thing and banish the BLUR) buying it at Wal-Mart sounds like the best thing to do. robert how can i banish the blur. thanx in advance. Though I’m no Cliq expert. Let me know what you find Alex, if you guys throw it up, I’ll give some link love! I will pass on this. No need to support the big wal EVER! Just FYI, although T-Mobile’s branding is all over this and they are using our towers for the coverage, this is a direct competition to T-Mobile. We do not provide the customer support nor do we get the added customer base. Wal-Mart is the one who will support this. Are you retarded? 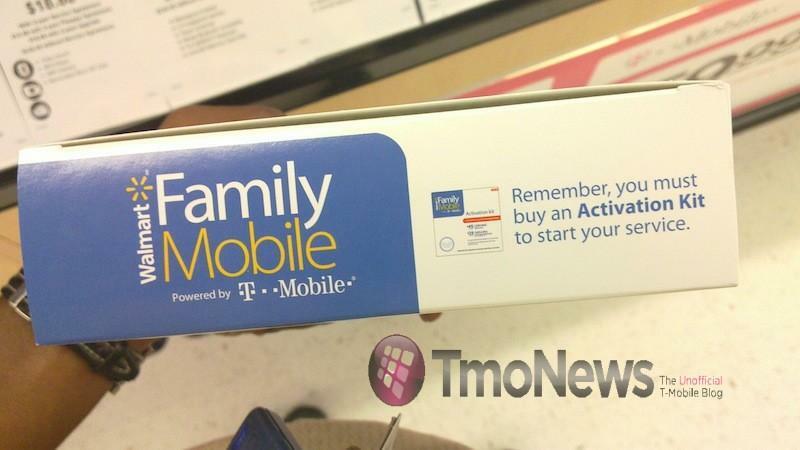 T-Mobile directly benefits from MVNO’s. They pay to use the network and and it boosts T-Mobile’s subscriber numbers. Not to mention they get to offload these reject phones. First of all, no I am not retarded. Ironic though, that question coming from the picture you have there. I did not say that T-Mobile would not in any way shape or form benefit from this, I specifically stated that this will be in direct competition to T-Mobile. I did not say it was a bad business move, nor did I imply that this will put T-Mobile out of business nor that there will be a merger between T-Mobile and Wal-Mart or any other such nonsense before you go flying off the handle again. Read the post. This WILL be in direct competition to T-Mobile, potentially taking away subscribers. When they dial 611 they will get Wal-Mart customer care, not T-Mobile. Their bills will be from Wal-Mart, not T-Mobile. Before you start going off on an ignorant rampage get your facts straight. The primary benefits T-Mobile gets by this is the branding and the subsidy from the reselling of the services. Watbetch, why are you so mean and bitter…and fugly!? I told you before to stop insulting people over stuff you don’t understand. You really make yourself look stupid when you do this. Knock it off and get some counseling for your imbedded anger and bitterness towards people. Definitely not an increase of Sub’s, increase in traffic only. Will T-mobile end up price matching this? If not I think I would rather switch to a cheaper alternative and go with Walmart. Impossible to price match this. Remember, Wal-Mart won’t have the cellular overhead (tower maintenance, federal taxation, etc.) to cover (just like your Boost and MetroPCS) thus allowing them to sell it for less. Also they are not subsidizing the phones which causes them to sell essentially at full retail price. Plus this is not where the bulk of their profits will be coming from. For them this is just another product they offer like a shirt or a TV. OK thanks for the info, I never paid much attention to the Cliq so I never knew there were two different Cliq phones. So how will this work, can you take your off contract high end Vibrant, G2, Slide…etc, and use this rate plan with a special sim card or something? I think this is a fantastic offer, except for the data part. Thanks to David for the great info. I’d guess you need the “Activation Kit” that the Cliq XT box talks about and that will include a SIM. 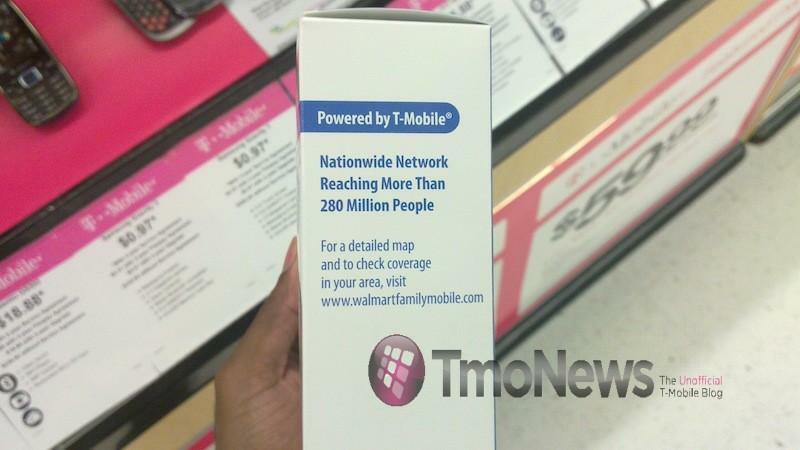 Does anybody know if when you get this deal from WalMart, can you roam…or is it TMO towers only? Data pricing above is incorrect. While the part about 100MB included for free is true, it can only be added as follows: $10/200MB, $25/500MB, $40/1GB. The ‘datapacks’ as they are called do not expire, and are shared by all users. I would consider this, the more I think about, I spend most of my time on wifi! I could easily get by with 1GB, big question is, how will this work if you don’t buy the phone from walmart, lets say you want to use it on your current off contract Vibrant, Slide, etc. Would need to get the phone unlocked, and then it will work. Will the Straight Talk phones work with this new plan??? Or is my Straight Talk phone now obsolete??? 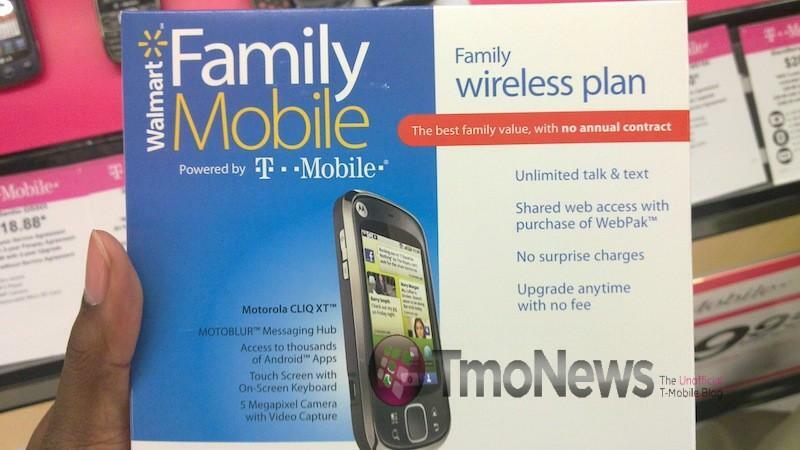 Your phone isn’t obsolete, because WalMart will continue to offer straight talk (and it’s better for individual line, unlimited talk/text/web for $45), however the phone can not be used on Walmart Family Mobile because it is a CDMA device (using Verizon Towers), not GSM (Using T-Mobile towers). If I’m on EM+ can I port my num to WFM????? Here’s the catch though. I just got back from Walmart where I was going to sign my wife and I up for the family plan. Both of us have had our numbers for 10+ years, so they are different area codes. Family Mobile will *not* port numbers with different area codes in, so if they port my number then she has to lose hers, or vice-versa. That’s a deal breaker for us! How will they activate the phone ? You need data right ? Maybe thats the only reason they need the activation kit. The phones do not come with sim cards in the box, the activation kit is required to differentiate between a customer who is getting new service, as opposed to a customer buying a new phone for an existing line. What I like about this the fact that any unlocked gsm device can be used. 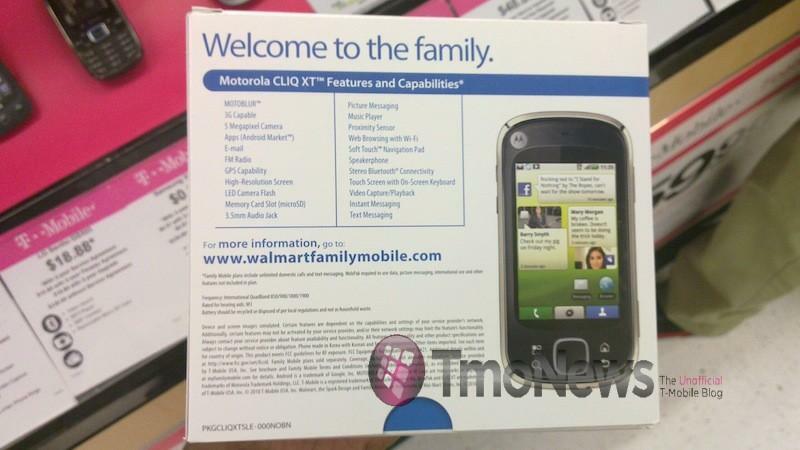 So while its walmart branded, I can use a phone that doesn’t make me at least look like a cheap sob. Straight talk does offer better coverage however, their phones selections really isn’t appealing. From what I’ve read the average user of smart phones use around 250 mb a month. Blackberry users only use around 50-70 mb per month. Of course if you stream music do a lot of data intensive activities on the phone you will use more. All in all this is good for the industry to put pressure on the larger carriers to lower their talk & text rate plans. Has anyone stopped to really think why T-Mobile is selling their service so much cheaper through wally world than they do with their regular customers? Simple, its a tactic when preparing to sell off a company, fluff up the numbers, and in the cell industry the numbers are the customers. Its also why alot of people have found features being added to their plans that they didn’t request, to make the company appear to be worth more to the next owners.